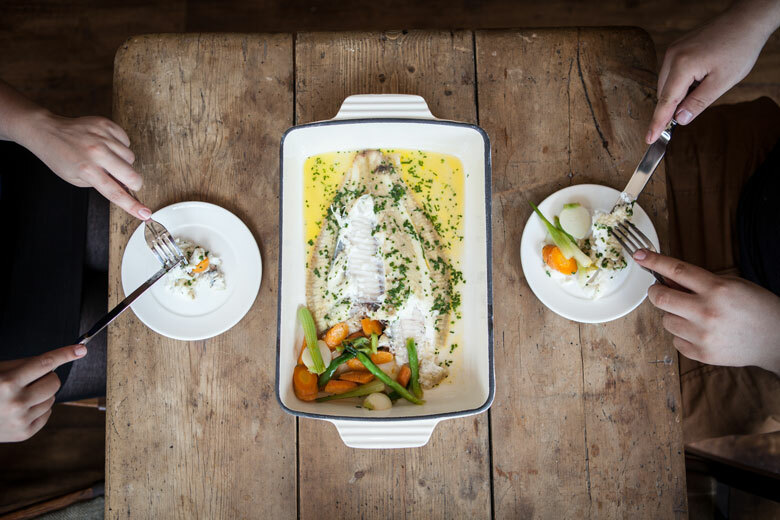 After honing their skills in London, young chefs Richard Adams and Jay Liddicoat, both scions of the Newlyn fishing community, have just opened an exciting new pop-up in Penzance. 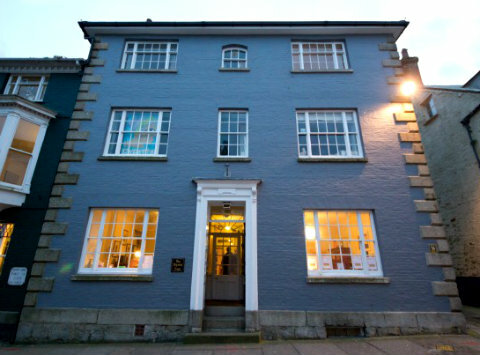 The Lost and Found Café is a great spot for lunch and tea, serving up particularly good home-made cakes in a vintage shop in handsome Trevelyan House on Penzance’s Chapel Street. Usually, at the end of the day, the door is pulled shut behind the waitress locking up. But not this summer. Drop by on a weekend evening from now until September and you’ll see lights flickering in the town house windows. You’ll hear an excited buzz and you’ll smell fish cooking, prepared by a local duo who have returned to their hometown to run a summer pop-up called Lost and Found Fish. The name has something of the prodigal son about it, which is appropriate. Chefs Richard Adams and Jay Liddicoat both left Penzance five years ago to study and train in London. They spent nine months together in the kitchen at Shane’s on Chatsworth in Hackney, before going their separate ways, Richard to the Beagle London in Hoxton, Jay to Mark Hix’s restaurant in Selfridges. Six months ago, they joined forces again and – together with front-of-house friend Ben Hearn – devised a plan to head home and launch their own venture. 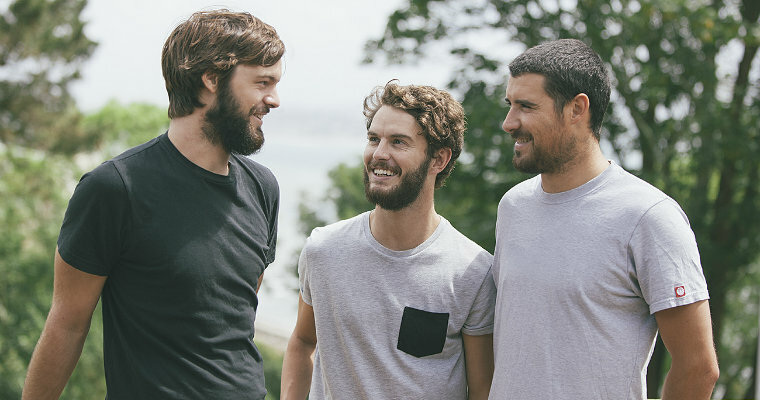 Left to right: Richard Adams, Ben Hearn and Jay Liddicoat. This translates into respect for the fish, which is at the heart of the restaurant’s concept. “We don’t want to mess around with the fish,” says Richard, stressing the beauty of a perfectly cooked fillet with a simple vegetable side. 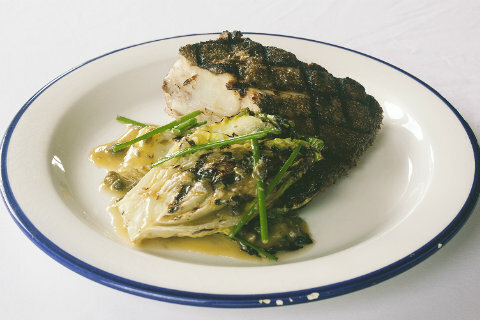 “We have an ingredient-led, adaptable menu, so if one particular fish isn’t at its best, then we can easily switch it with something else which has come straight off the boat in Newlyn.” Dishes range from monkfish served with wild leeks and saffron, to turbot with grilled baby gem and capers. The chefs use a “start to finish” approach with other ingredients on the menu, making everything from bread to pasta, ice cream and even cheese in-house. 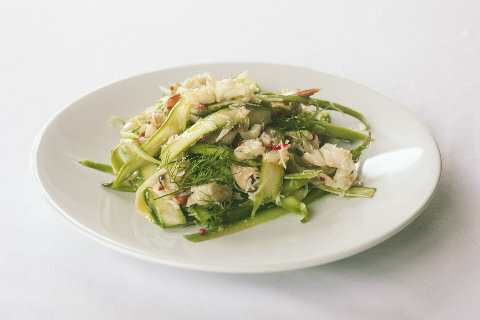 Spider crab, asparagus and chilli: perfectly now in every way. Adams already has plans on the horizon for his own small-scale sustainable enterprise. When working at a sardine processing plant, he noticed that boxes of sardines were getting discarded every day, because they were too small for the filleting machine. These tiny fish made a great twist on the Spanish delicacy, boquerones. Though the Spanish dish is usually made by pickling anchovies, Richard discovered that pickled sardines work just as well. 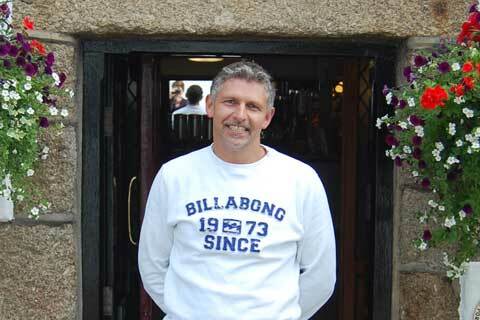 He also pegged the launch of Lost and Found Fish to the return of Cornish sardines – formerly, and rather less glamorously, known as pilchards – to Mount’s Bay, the stunning horseshoe on which Penzance and Newlyn are set. 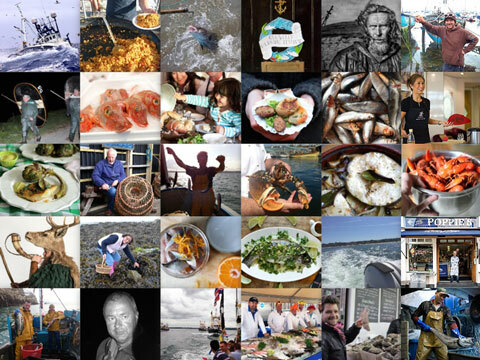 It’s this kind of local knowledge and passion that makes Lost and Found Fish such an enticing prospect. Richard’s father gives him a regular heads-up on where the local boats are and what they’re catching. As soon as they land at Newlyn, the pair have first dibs on what’s best and freshest for the evening’s menu. Other suppliers range include roadside farm shops, small, local producers and also the cliff tops and hedgerows of Penwith, over which the young chefs forage. It’s still early days yet, but the model already looks successful with a manic opening week and a Twitter feed awash with praise. Whatever happens, Lost and Found Fish will only run through to September, when tourism in Penzance dips. But this is just the start of adventure. With talk of something more permanent, or a sideways move into production, clearly this journey is just beginning for them. And it’s a terrific development for the area, bringing a shot of hip Hoxton style and making up a string of gastronomic pearls, with Ben’s Cornish Kitchen on one side in neighbouring Marazion and the brilliant Ben Tunnicliffe’s Tolcarne Inn right by Newlyn harbour itself on the other. Look out for more on him on this website soon. Lost and Found Fish is open 7pm-10pm, Thursday to Saturday. To find out more, visit www.lostandfoundfish.co.uk. To book, call 07532 050228. This dish by Lost and Found Fish, last summer’s Penzance pop-up, is typical of their fresh and simple style, with the brill very much the star of the show. Spider crab is a much under-used ingredient, cheaper than brown crab, and it’s slightly moister flesh adds a unique buttery texture to this dish. So simple and a perfect celebration of asparagus while it’s still in season!